"This gem of a book, about a heist of archival birds, is marvelous, moving, and transcendent. I can’t stop thinking about it." "This extraordinary book exposes an international underground that traffics in rare and precious natural resources, yet was previously unknown to all but a few. A page-turning read you won’t soon forget, The Feather Thief tells us as much about our cultural priorities as it does about the crimes themselves. There’s never been anything like it." "A true-crime tale that weaves seemingly unrelated threads—a museum break-in; the development of evolutionary theory; a case of post-Iraq PTSD; endangered birds; and (above all) the murky underworld of fly-tying obsessives—into a spellbinding narrative tapestry." 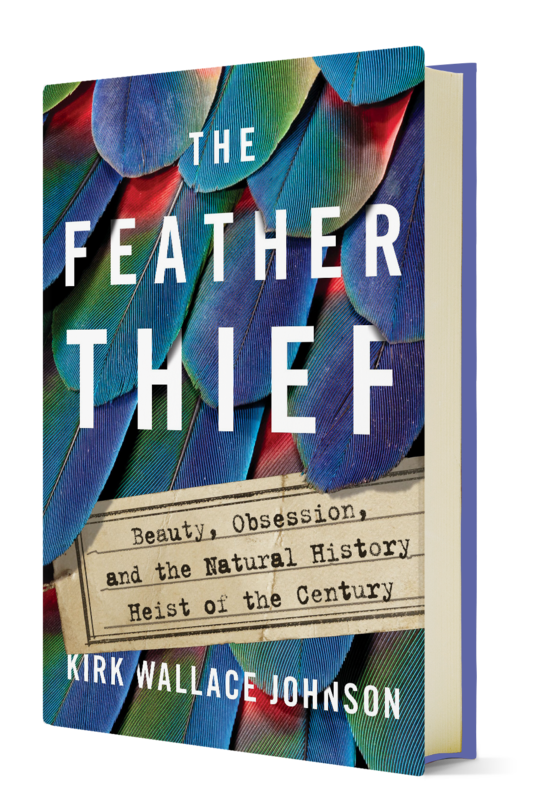 "The Feather Thief is a captivating tale of an unlikely thief and his even more unlikely crime, and a meditation on obsession, greed, and the sheer fascination in something as seemingly simple as a feather." "A stirring examination of the devastating effects of human greed on endangered birds, a powerful argument for protecting our environment—and, above all, a captivating crime story." Pasadena Casting Club San Marino Masonic Lodge 3130 Huntington Dr.
Golden State Flycasters Tio Leo's Mexican Restaurant 3510 Valley Centre Dr.
Sespe Fly Fishers Church of the Foothills 6279 Foothill Rd. Sierra Pacific Fly Fishers Monterey at Encino Glen 16821 Burbank Blvd. Orinda Books Orinda Books Ltd 276 Village Sq. Rakestraw Books Rakestraw Books 3 Railroad Ave. The Rediscovered Bookshop The Rediscovered Bookshop 180 N 8th St.
St. Louis County Library St. Louis County Library 1640 S. Lindberg Blvd. Society for the Preservation of Natural History Collections Chicago Hilton 720 S. Michigan Ave.
Douglas County Libraries + Tattered Cover Douglas County Public Library + Tattered Cover 9292 Ridgeline Blvd. Bud Werner Memorial Library + Off the Beaten Path Bud Werner Memorial Library 1289 Lincoln Ave.